Loom beading patterns are rows and columns of bead-shaped rectangles with colors or symbols that indicate which colors of beads to stitch in each row. When beading patterns are colored in, they're a close representation of what your finished beadwork will look like. Loom beading patterns can also be used with square stitch since the beads are aligned in the same configuration. In addition to a beading graph, many bead patterns will also have a word chart that uses a letter to represent each bead type along with the number of beads of that type in the row in the order they occur. This article describes how to follow a beading graph pattern as well as a word chart. If your pattern is online or on your computer, you can either print it out or bring it up on your computer screen. If you're using a pattern from a book or magazine, you may want to scan it and print out a copy. Many people like to make a copy of the beading pattern because they like to make marks on the pattern to keep their place. This tutorial uses the Moroccan Coral bracelet pattern. The first step is to obtain the colors of beads listed for the pattern. You don't need to use the exact colors of the pattern but you will need to select substitute colors. Most loom beading patterns use Japanese cylinder beads such as Delicas or Tohos in size 11. The Moroccan Coral pattern suggests using Miyuki Delica beads. The updated pattern available at the link uses similar, but not the exact same colors. Use small condiment dishes or a beading mat to arrange your beads in the order they are labeled in the pattern: the A beads first, the B beads second, and so on. If you are beading from the pattern only, isolate the first row of the pattern by placing a sticky note, paper, or ruler over the rest of the pattern. This pattern begins at the bottom and goes toward the top. If you would prefer to read a bottom-up pattern from the top down, simply turn the pattern upside down. Following the example, you need to pick up 1A, 1B, 2A, 1C, 2A, 1B, 1A. The sequence is the same whether you read the pattern from left to right or right to left because this pattern is symmetrical. Many beaders develop a system that helps them pick up the right beads quickly. One method is to use a nickname for the beads and call out each nickname in your mind as you go along. For the first row in this pattern, the sequence you could repeat to yourself might be dark, light, dark, dark, salmon, dark, dark, light, dark. Stitch the first row of beads on your loom. When you're finished, they should match the order of the beads in the first row of the pattern. Learn how to bead on a loom. Move your sticky note or ​another marker to show the second row in the pattern. Pick up the beads for this row and stitch it on your loom above the first row. When you read a pattern from the top down, you still stitch your beads from bottom to top on the loom, as usual. 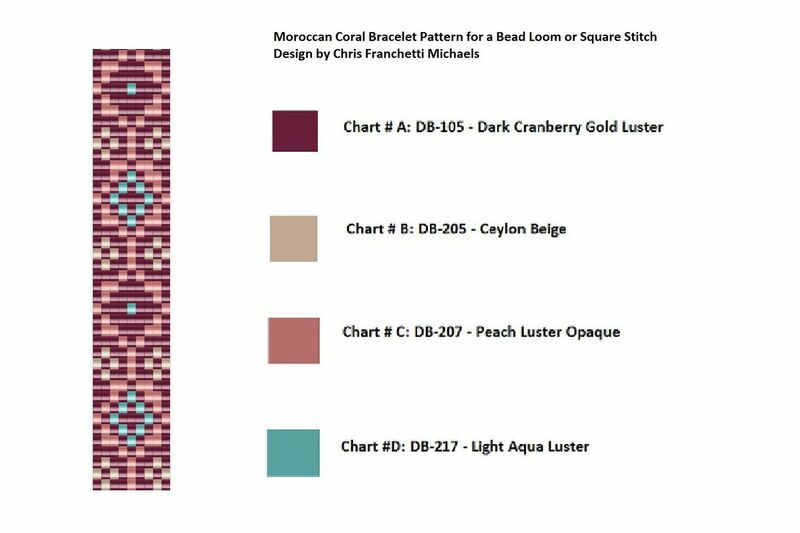 You would simply turn the beadwork around to see it match the pattern chart. Continue marking and stitching rows, one at a time, always reading the pattern in the same direction. In addition to a picture pattern, most beadwork patterns also have a word chart. The word chart uses a legend to correspond a letter or number to each color of bead in the pattern. Each row of the word chart represents one row of beads that are picked up in order. Many beaders have a preference for either a pattern or word chart, but they can work especially well when they are used together. The word chart is a simple way to recite the pattern, but it is easy to double check you picked up the right beads by comparing the pattern to your stitched piece. Beadwork patterns may be too large to display in a single column or page of a pattern. If the pattern has more than one column, move to the second column or page when you finish the first. Continue stitching until you reach the end of the pattern, or until you have the length of the band that you need for your design. Some loom beadwork patterns have a repeating pattern of colors and shapes. While most purchased patterns will display the entire pattern, some may not save space. The Moroccan Coral bracelet pattern used in this pattern is an example. After the first 20 rows, the same pattern is repeated until the bracelet reaches the desired length. When a pattern has a repeat, simply move your sticky note from the last row back to the beginning row to continue stitching, or go back to the first row of the word chart. You can also look at your finished beadwork to follow the rest of the pattern.